previously (as they say on Dexter, Buffy the Vampire Slayer and others, before wasting 10 minutes of airtime on recapping seemingly the entire series to date) I mentioned a new camera. Well, its not new. 1981 to be exact. But it’s new to me. And actually, given the concourse condition, it may as well be new. There’s not a mark on it anywhere. Maybe one of you will know what that is and probably no-one will actually care! But hey, I’m a technology evangelist, so I’m going to damn well educate you, like it or not. 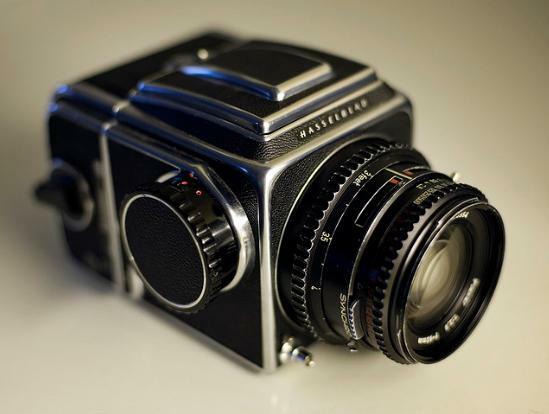 It’s a Swedish-made (no Austin Powers jokes please) medium format film camera. 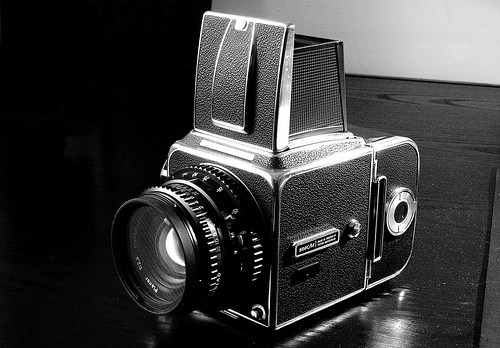 One of the very finest cameras from days gone by actually. It has a look down waist level viewfinder, no lightmeter – its totally manual – takes 12 shots of 6×6 medium format film (like the Holga) and is just amazing. Actually, mine is in much better condition than this one – its totally unused. So, watch this space for some pictures of a different kind. So exciting! Congrats on the new camera. I’m sure your pictures will be amazing! Its such an awesome thing, a real work of art – looking through the waist level viewfinder is such a treat – I just hope the films come out ok! I shall send a load off on Monday and we’ll see. Personally, I think you wasted a perfectly good MC Hammer opportunity in your title there. Have I taught you nothing!